1916, Fund Raising Bond der 3. Serie über 10 Yuan, #50162, 24,9 x 22,2 cm, ocker, rot, schwarz, oben etwas gestaucht, sonst EF, Text komplett in Chinesisch, Faksimile-Signatur von Dr. Sun Yat-sen (Geburtsname: Sun Wen). Rarität! 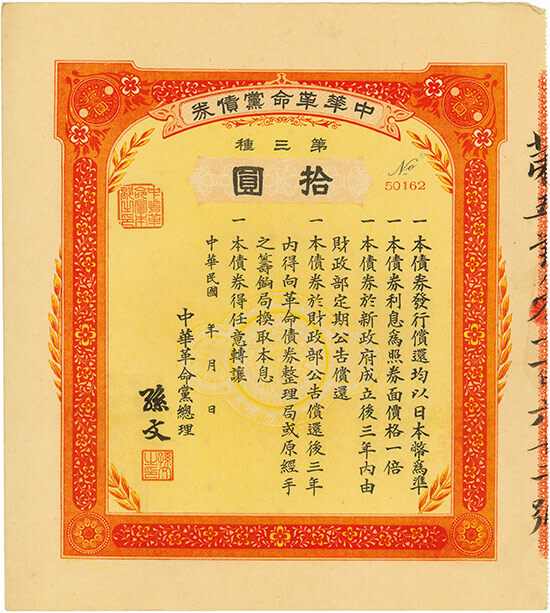 1916, Fund Raising Bond of the 3rd series for 10 Yuan, #50162, 24.9 x 22.2 cm, ochre, red, black, a little bit clinched at the top, otherwise EF, text completely in Chinese, facsimile signature of Sun Yat-sen (born as: Sun Wen). Rarity!